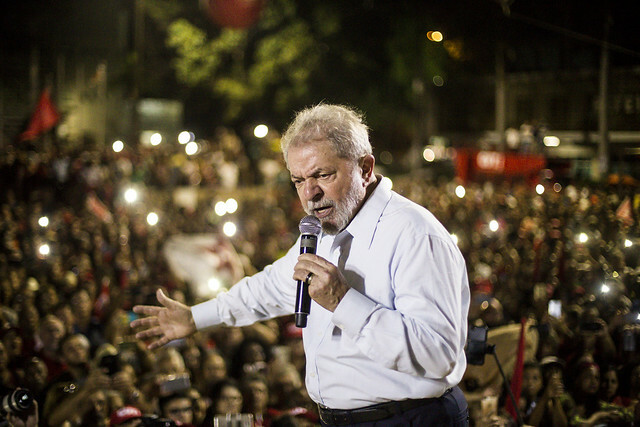 A judicial order for Lula's arrest was issued by federal police on Thursday. A few hours after former president and 2018 presidential election front-runner Luiz Inácio Lula da Silva’s preventive habeas corpus was denied by Brazil's Supreme Court (STF), judge Sérgio Moro issued a court order stipulating that the former president must turn himself in to the Federal Police by 5pm this Friday to start serving his 12-year sentence. In his order, judge Moro stated that the former president had pursued all of his legal options in the appeals court. He went on to that any future petitions filed by his defense team would have no bearing or impact on the appellate court's original decision. The decision by the Curitiba-based judged was published at 6pm local time this Thursday (5), a few minutes after the local appeals court issued an official communication authorizing the serving of the ex-president’s sentence. In his sentence, Moro forbids the use of handcuffs and describes the conditions of how the former president will turn himself, which will be decided between Lula’s defense team and the Federal Police in Paraná. “Let it be clear that given the dignity of the office he held, he has been assigned a separate cell at the Federal Police’s headquarters where the ex-president can start to serve his sentence. He will be separated from the other inmates so that he does not face any moral or physical harm,” Moro stated. Brazil’s most popular leader has been accused of accepting US$ 1.1 million in bribes from construction company OAS to pay for the remodeling of a beachside apartment in Guarujá, São Paulo state. Yet, out of the 73 witnesses to take the stand, not a single witness for the prosecution provided concrete evidence linking the apartment to the former President. There have only been confirmations that Lula visited the apartment on one single occasion. In a deposition last year in Curitiba, Lula said: “I did not request, did not receive, did not pay for any three-story apartment. I do not own it.” The former president explained he visited the apartment because OAS wanted to sell it to his family, but claims he did not ask for it to be renovated, as accused by the prosecution. Moro actually acknowledged OAS included the Guarujá apartment in a plan for its judicial recovery, and that it was legally owned by the company, and not by Lula. In addition to Lula, other defendants in the case are Agenor Franklin Magalhães Medeiros, former director of OAS; Fabio Hori Yonamine, ex-president of OAS Empreendimentos; Léo Pinheiro, ex-president of OAS; Roberto Moreira Ferreira, ex-director of OAS; Paulo Okamotto, president of Instituto Lula; and Paulo Gordilho, an OAS executive. International and legal observers have repeatedly noticed abuse of power and judicial irregularities by judge Moro in his handling of the Car Wash case. Moro became nationally known for the speed in issuing the sentences with regards to Operation Car Wash. His rulings lead to the conviction of Lula’s and many other powerful politicians and businessmen. Regarding the ex-representative Eduardo Cunha (from the MDB party), the conviction was issued in less than 48 hours after the judged received the closing statements. The Workers’ Party (PT) has called for a protest in solidarity to the ex-president this Thursday at the Metal Workers’ Union in São Bernardo do Campo (SP), the hometown of the ex-president and where he started his political career. Meanwhile, leaders throughout the region from countries such as Bolivia, Cuba, Uruguay, and Venezuela all criticized the Supreme Court ruling along and the subsequent arrest order.